Come ride with us to explore Prague and Krakow - the ancient capitals of the Czech Lands and Poland - and the unique cultures between them. This important route is framed with 6 UNESCO world heritage sites, numerous castles and plenty of little towns and hidden villages! We start upstream the river Elbe from Prague. On the way we do not miss the famous Kutná Hora, once the largest silver mine in Europe, nowadays charming medieval town! Departing the Elbe, the route offers us colorful towns like Litomyšl or Moravská Třebová and mighty castles crowned by the fairytale-like Bouzov. Crossing the wooded and peaceful highlands, we descend to the old Moravian capital Olomouc. Integral to Central European history, this beautiful city is sometimes called " The Small Prague". Next we meander to the foot of the Beskydy mountains, enjoying their fantastic panorama before the route introduces us to picturesque towns like Hranice or Štramberk. Entering Poland through the Těšínsko region, we bike this lake-filled land to admire the old town of Pszyna with it's chateau and open air museum. Recent history obliges us to visit Oswieczim (Auschwitz) with its dreadful WWII history and nearby Nazi concentration camp. From here we continue through gentle landscapes along the Amber trail to the historical capital Krakow to admire its old town and the regal Wawel castle. 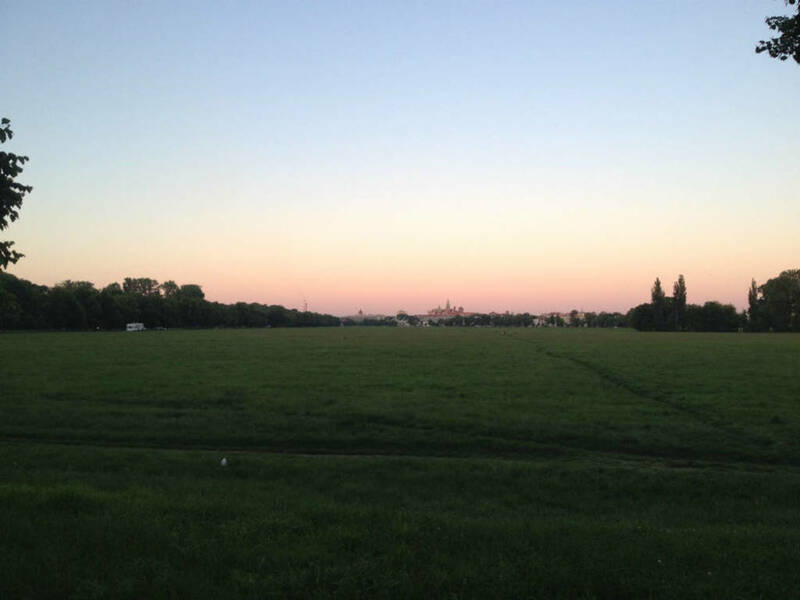 Day 0 – Arrival to Prague - not included in price! Description of the day: This day is yours to explore Prague, the "Paris of the Central Europe" Relax, stroll or treat experience a unique Prague-by-bike tour (see more in our Prague-by-bike section). Do not hesitate to ask us for this extra tour – it is our clients favorite! If time is not your worst enemy, we do propose you stay in Prague more days to fully explore its beauty and hidden corners. Feel free to ask us about more nights or other attractions! Hotels: Night in Prague is not included as most of our guests prefer to stay more nights. Therefore we offer large variety of hotels which we are happy to recomend ( ** / *****). Day 1 (X) Prague - Nymburk - Option B skip this part by a train/car! Description of the day: Prague's urban planners were certainly forward-thinking – part of our bike route follows right atop the metro tunnel! Escaping Prague,we bike north east towards the fertile Polabí region, stopping on the way in the old towns of Čelákovice and then Přerov nad Labem, home of the oldest village culture museum in Europe. On a hot day, take the chance to swim in a local lake before we arrive at the old royal town of Nymburk with ancient walls bordering the Elbe, While here we must taste the local Postřižiny beer to commemorate the Czech writer Bohumil Hrabal who grew up in the local brewery! Option B: In the morning you will be transfered by train/car from Prague to Nymburk – from here we will continue as per itinerary. Description of the day: On a pleasant and easy bike trail we'll roll along the river to the spa town of Poděbrady and continue to the royal town of Kolín with its ornate Renaissance synagogue. From Kolin we will leave the Elbe River and bike to one of the UNESCO Heritage sites on our "to-do list" – the old silver mining capital, Kutná Hora. Through the Middle Ages it was one of the most important towns in Europe, extremely rich due to its mines, coin mint and location on trade routes. Thanks to all this we can relax in the cozy old town comprised of fascinating Medieval and Baroque structures. Crowning it all is the stunning St Barbara's church – a real jewel of Gothic architecture! Description of the day: Before we leave Kutná Hora we will visit an extraordinary venue – the Sedlec ossuary, whose decorations were created using the bones of more than 30 000 people, making it a curious and macabre exhibition. 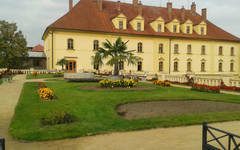 Just before we return to the Elbe, we can visit a lovely Classical-style chateau, Kačina. Rejoining the river we pedal to the Kladruby national stud farm, which has produced exceptional horses for the Habsburgs since the 16th century. In the afternoon we'll bike along the Buňkov lake, taking a pause to relax on the beach or even swim. Today's last stop is the medieval town of Pardubice. A charming, quiet old town with a nice chateau and old lanes, but home of the SEMTEX plastic explosive too. For those looking for something sweet - you've found it! - Pardubice is the Czech capital of traditional gingerbread. 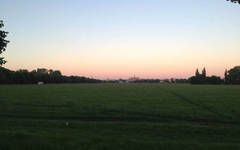 Description of the day: As we leave Elbe river, we meet our first gentle hills and the mighty castle Kunětická Hora. Little detour and climb up the majestic hill is definitely worth a try! After a pause we reach the river Loučná, following it to the village of Vraclav and its memorial to the Vršovec noble family. Next stop is the town of Vysoké Mýto: Today the hub of bus construction, its much longer history is displayed by a beautiful town square and nicely preserved city gates. Today's lodgings are in the UNESCO-protected town of Litomyšl, home of a fantastic Renaissance chateau with stunning gardens. Litomyšl is also the birthplace of the renowned composer Bedřich Smetana, a man celebrated every year with a classical music festival - a highlight of the Czech cultural calendar. 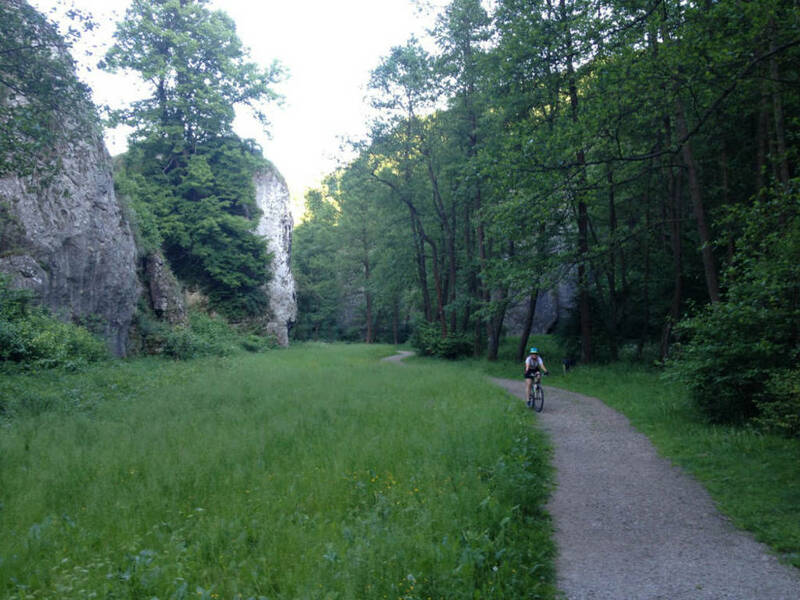 Description of the day: This day we say good-bye to Bohemia,crossing the historical border to Moravia as we bike the gap between the Bohemian-Moravian Highlands in the south and the Eagle Mountains in the north. 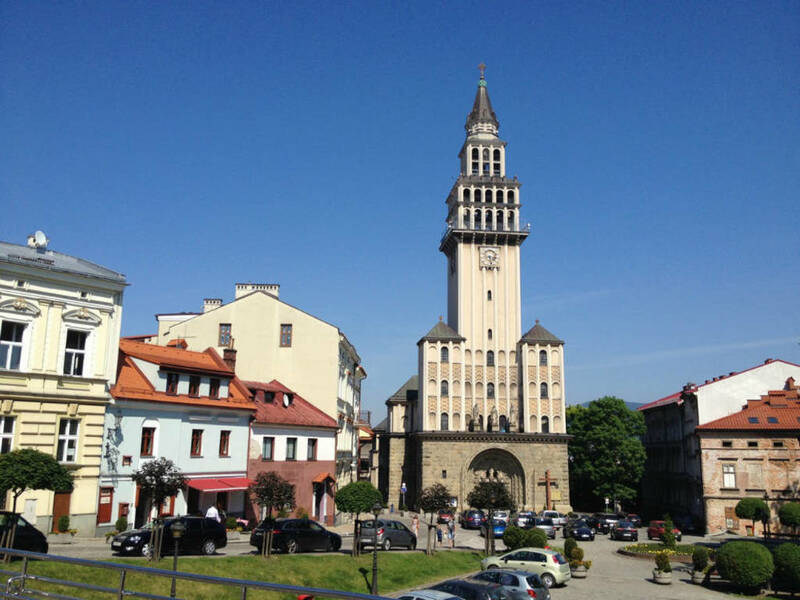 We can admire the Renaissance town of Svitavy with its beautiful square and explore the history of its most famous resident, the locally-dislike Oskar Schindler. From here we do have to climb over the Hřebeč range, but our route soons descends easily towards our lodging in the town of Moravská Třebová. 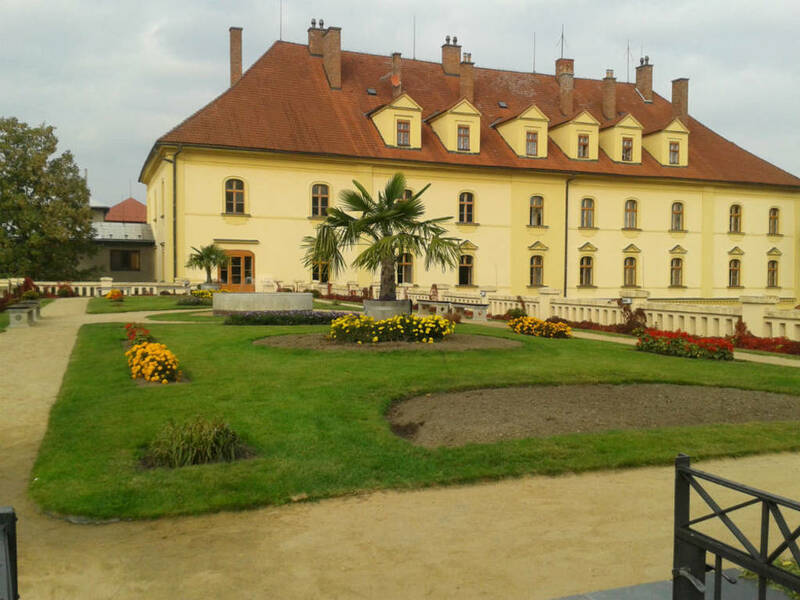 This little town has a fantastic Renaissance chateau, one of the best examples of that in the whole Moravia. Description of the day: Our day starts nice and easily on the River Třebůvka, Still skirting the old border between Bohemia and Moravia, there is a high density of castle ruins, mostly just a couple of stones today. But when we do leave the river we meet the biggest of today castles – Bouzouv, one of the most romantic places in the Czech Republic. Shortly afterwards we leave the highlands and descend to the River Morava which more or less guides us through the rest of the day. If you are interested in reaching our lodgings more quickly in the UNESCO city of Oloumoc, feel free to take the train; otherwise enjoy the bike route along the meandering river. The ancient capital of the Moravia Empire, Olomouc rewards it visitors with fascinating sculptures, dramatic churches, and a communist-era astronomical clock. Description of the day: Today we follow the Bystřice river. First we reach the Tršice region with its beautiful views of Svatý Kopeček (Holy Hill). Arriving in Přerov we reach the Bečva river and following the nice bike trail upstream. In Lipník we can admire the town center complete with a castle and extraordinary gardens, or we can make a detour up the hill to the mighty Helfštýn castle. Further upstream we reach the town of Hranice with its Renaissance square. On the other bank of Bečva we can relax in the local spa Teplice nad Bečvou. Description of the day: This day is one of the most demanding but interesting of our whole tour. The closer we get to Czech-Polish-Slovakian border, the more castles, castle ruins and historical towns we will meet. In the morning we follow the Bečva river for some last kilometers before the route turns uphill to discover some nice views of Starý Jičín and its castle ruin. Next stop is Nový Jičín with its picturesque old town and funny fountain on the square. From the town we continue up and down with some early views of the Beskydy mountains till we get to Štramberk. This lovely little town, with wooden houses and a mighty castle tower above it, is know for it's gourmet Štramberk Ears! Day 9(X) Stramberk - Cesky Tesin - Option B skip this part by a train/car! Description of the day: Right after we leave Štramberk we enter the small town of Kopřivnice - home of the famous Tatra trucks. Next stop in this rather hilly morning is Hukvaldy, a small town overlooked by a mighty castle. Most of all the town is known as birthplace of the innovative 19th-century composer Leoš Janáček, whose house borders the bike route! After that we follow the small river Ondřejnice to the twin town of Frýdek-Místek just in time for lunch. In the afternoon we bike along the Žermanice lake, a nice spot for a swim! Arriving even before we dry out, we stay in the border town(s) of Český Těšín/Cieszyn. Description of the day: In the morning we cross the border and start the Polish part of our journey. The small roads gently meander away from the mountain views behind you. First stop is the small town of Skoczow where we join the Wisla river. 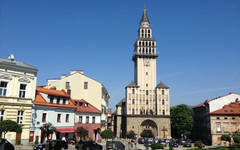 From there on we bike through a land of lakes crowned by the mighty Goczalkowicke dam to the historical town of Pszyna. Here you can visit a nice chateau and the regional museum or the Zubr (European buffalo) nature park. We will conclude our day in nice historical town of Oświęcim, sadly known for the nearby WWII concentration camp Oświęcim/Auschwitz. Option B: In the morning you will be transferred by train from Hranice to Český Těšín – from here we will continue as per itinerary. Description of the day: On this last day of our bike tour we will continue along the River Wisla upstream to the historic town of Lipowiec. Here we can climb to a majestic castle ruin or visit the town's open air museum. 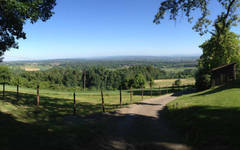 From here the route climbs a couple hills to reward us with wonderful views of the surrounding countryside. 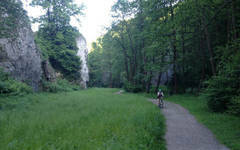 Next stop on the way will be the monastery in Alwera or the cave complex in the protected nature area near Baczov. We will conclude our day and whole tour in the historical town Krakow, known as the seat of Polish kings and archbishops. TIP: Those willing to visit memorial site and museums in concentration camp Auschwitz can shorten or skip their bike ride with a train transfer to Krakow. Description of the day: We highly recommend you take time to tour this magnificent city, the former capital of the Polish kingdom full of picturesque places and buildings. If you have more time, we highly recommend trip to impressive historical salt mines, located only short ride from the town!